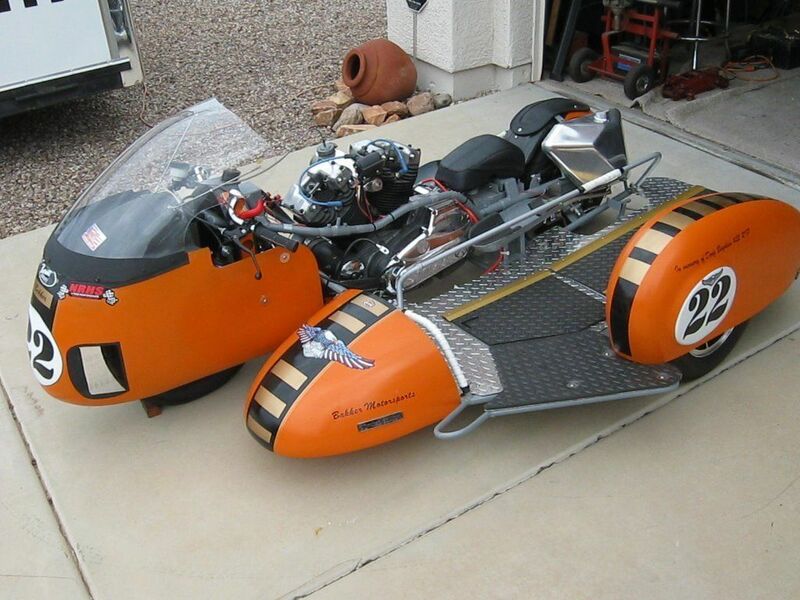 Sidecar For Sale: Vintage Harley-Davidson Racer | Sidecar Racers Association West, Inc.
Up for auction is a one of a kind, 1976 Harley Davidson 1000cc vintage sidecar racer! Bob Bakker, of Bakker Racing, personally built this beast with his own two hands! Before I go into any further detail on the build, I’d like to talk about Bob for a minute. Bob is one of those amazing people you probably have not have heard of, but he has been right there, elbow to elbow, working with motorcycle legends for almost 65 years! Bob has been handbuilding and racing sidecar racer motorcycles since the mid 1950’s and built his first racer from scratch in 1958. His lovely wife pictured raced with Bob from 1971-1977…she was the “monkey” hanging off the sidecar…but don’t call her that or you’ll regret it! 🙂 Bob currently has 2 builds owned by the Barber Museum: a 1989 Sidecar Suzuki 1000cc landspeed Streamliner that was clocked at 175mph, and a 1964 BSA A-65 Road Racer sidecar that he raced back in the early 1960’s. The American National Motorcycle Museum owns his last Bonneville record attempt (2011) landspeed sidecar. A Turbo Hiyabusa that hit 161mph. It is the current record holder for 1350cc gas blown sidecar class raced that day by AMA Hall of Famer Larry Coleman and passengered by longtime bonneville multi record holder Warren Ryan. Bob hung out with Bud Ekins in the 1950’s and 1960’s here in California. In 1966 he made a few visits to the Rickmann Brothers workshop in the UK. They wanted a dealer in the U.S., but since Bob was not a dealer, he turned his friend Bud onto the idea, and the rest is history! Bud Ekins sold Rickmann desert racers to Steve McQueen and other “movie types”…thanks exclusively to Bob. Bob also worked with Sonny Angel on both road racing and Bonneville speed efforts…sharing race ideas, and motel rooms! He helped Bob Hansen out on several road race events when Hansen was known as “The Green Meanie” while he worked with Kawasaki. By the way, Bob Hansen is the man who gave Mr. Honda the idea to make the Honda CB750 four cylinder back in 1967!! He also has done some work for Jay Leno on frames by way of the late great Mike Parti. Both Bob and Bud Ekins worked together fixing up all the bikes Steve McQueen abused throughout his motorcycle career. He also did R&D for Tony Murphy of American Honda Motor Company in 1961, road testing their prototype CB72 250…that later became the 305 Superhawk. Bob also set records at Bonneville, and at Irwindale 1/4 mile drag strip in the 1960’s. He raced the Hare and Hound races as well as the Catalina races until 1958…the last Catalina race. He also raced the Baja 500 as well as AMF and AHRMA race circuits.